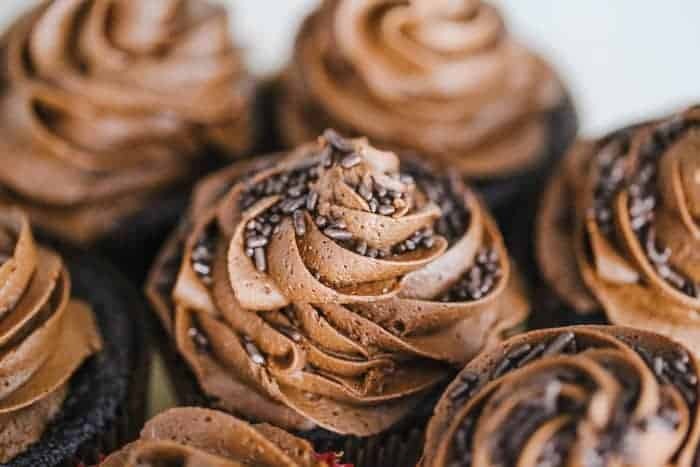 These Ultimate Vegan Chocolate Cupcakes are sooooo divine! Heavenly divine! 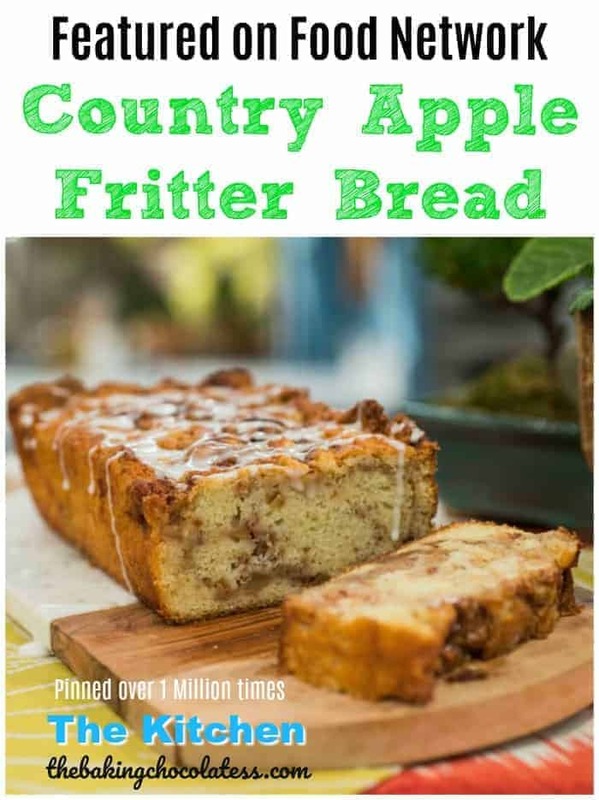 This recipe originates from the Great Depression when eggs, butter and dairy were expensive or hard to come by, so bakers were inspired to find other ingredient substitutions with what they had in their pantries for recipes. It’s been called Chocolate Depression Cake, Crazy Cake AND Wacky Cake. 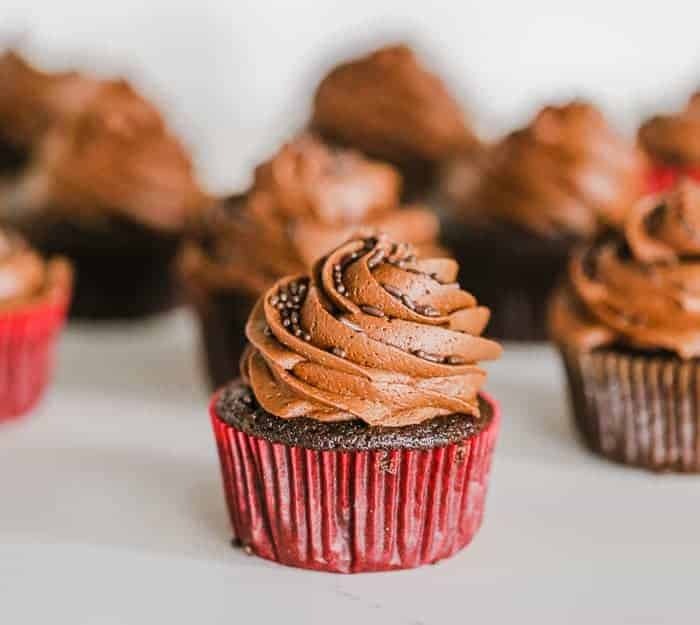 Egg-free and dairy free, these cupcakes taste exquisite and it’s an especially wonderful recipe for those with allergy issues, or parve dietary restrictions. BTW…If the word ‘vegan’ scares you, don’t be scared. 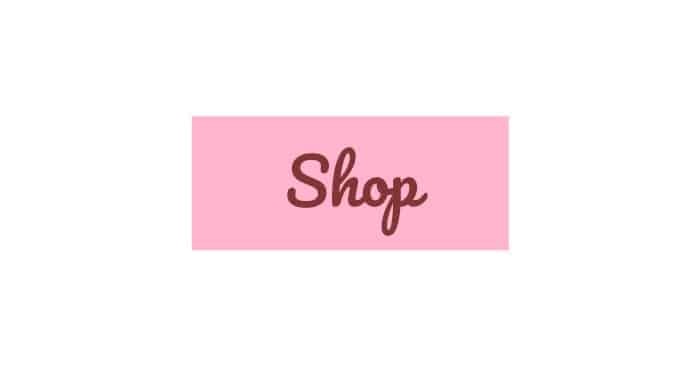 It basically means, no meats, eggs or dairy. Vegans can have sugar. 🙂 We’re good. 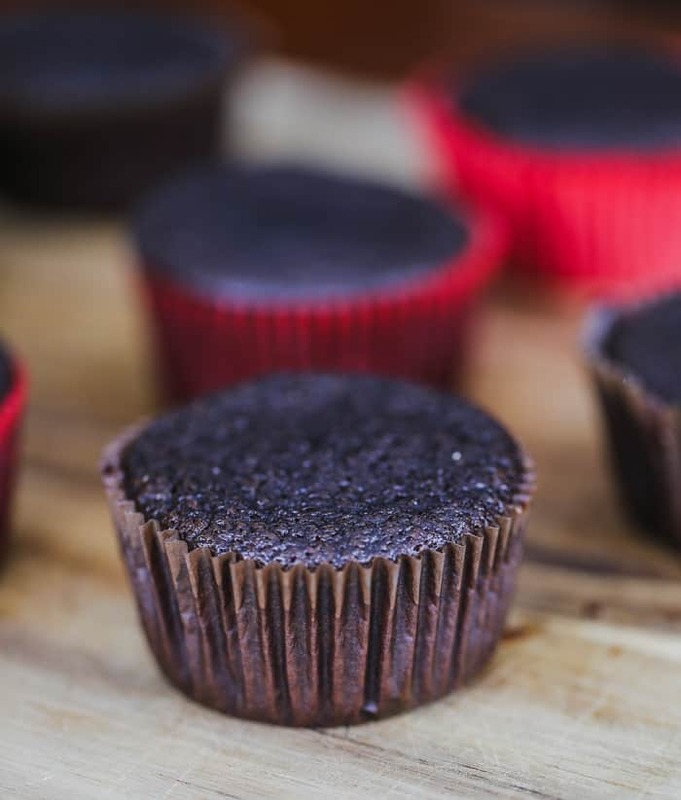 Being that these have no eggs, it’s absolutely crazy that these would even be moist, but they are super moist, with a rich chocolate flavor. Pretty sure that’s why they called it a crazy cake? The eggless batter means that the structure of the cake is entirely supported by gluten, which in this case, is strengthened by the acidic white vinegar and salt added in. 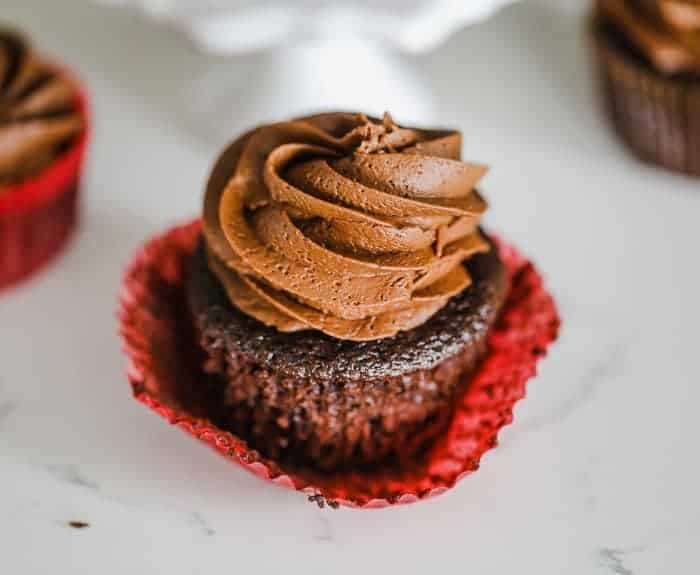 All I know is, it has the perfect amount of chocolate flavor in these sinfully delicious moist and light cupcakes and equally in that luscious ultra chocolate frosting. I could eat the whole bowl of that frosting, let me tell ya! 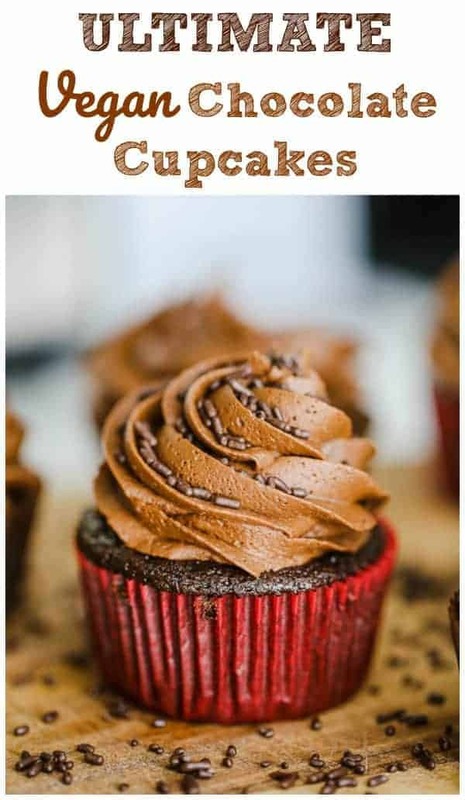 You will never be able to tell that it’s egg-less, and the best part these cupcakes stay fresh & moist up to 3-4 days! I know my son would especially love these. He’s vegan, but he lives in way down in Florida. 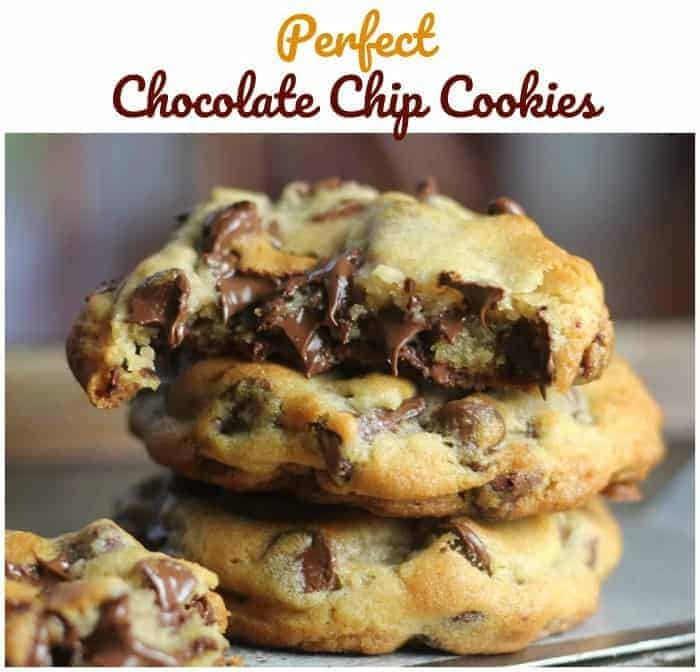 I’ll have to make these for him and the family when I go down in March for the arrival of our second grand-daughter. 🙂 And now he’ll have the recipe when he wants to make them for his girls and maybe stash a few for himself. Let’s rock ‘n roll these vegan babies out! 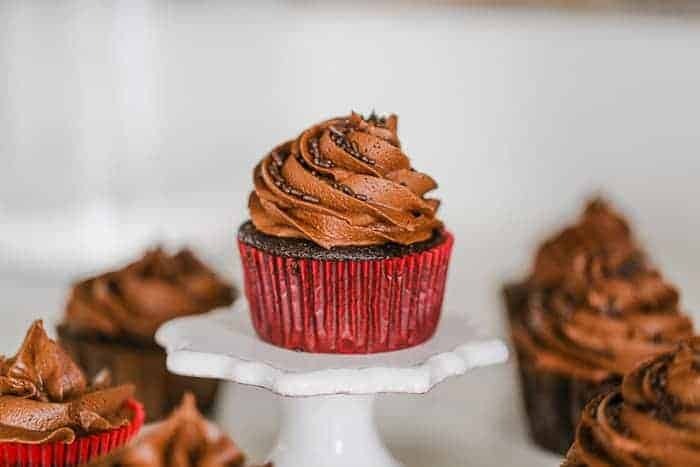 Check out another Depression Era dessert–This Super-Moist Chocolate Cake with Chocolate Buttercream Frosting is made with a secret ingredient for the moistness! Can you guess what it is? 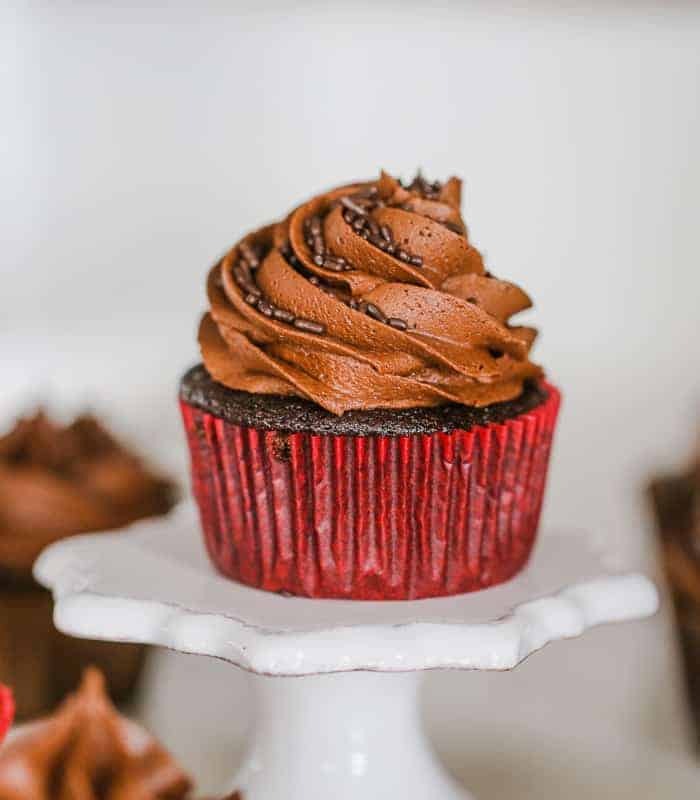 These Ultimate Vegan Chocolate Cupcakes have the perfect amount of chocolate flavor in these sinfully delicious moist and light cupcakes and equally in that luscious ultra chocolate frosting. Egg-free and dairy free! Preheat oven to 350 degrees. 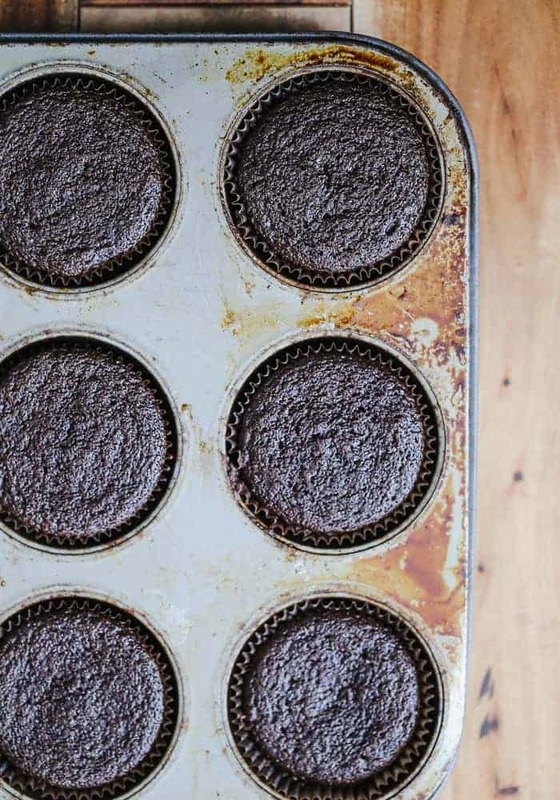 Line prepared muffin tins with paper liners. Lightly spray with non stick cooking spray and set aside. In a measuring cup, stir almond milk and vinegar together. Set aside to curdle. In a large bowl, using mixer, beat oil and sugar together. Mixture will be gritty. Add in extract of choice and mix. In a different bowl, whisk together all dry ingredients together until evenly mixed. Alternate mixing in wet and dry ingredients to the oil/sugar batter starting and ending with dry. 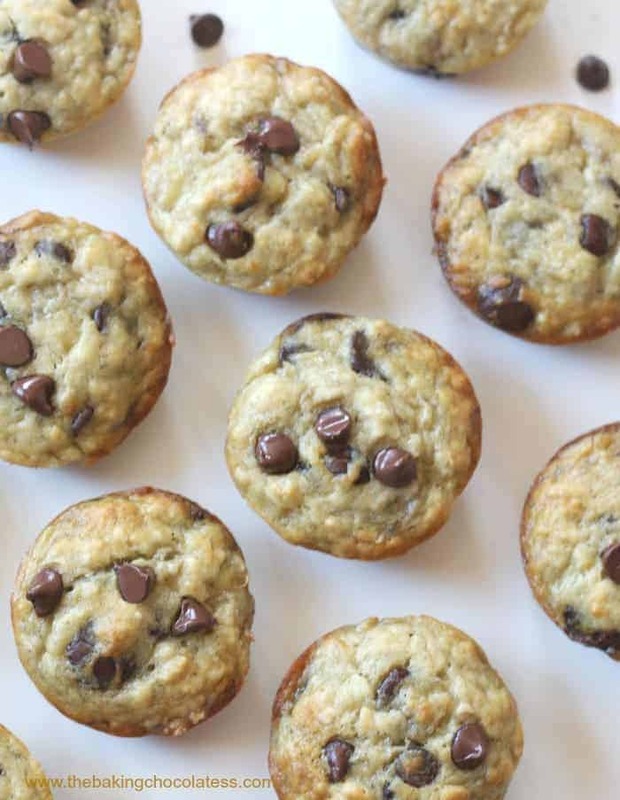 Pour evenly into prepared muffin tins with paper liners, fill 3/4 of the way full and bake 15-18 minutes. 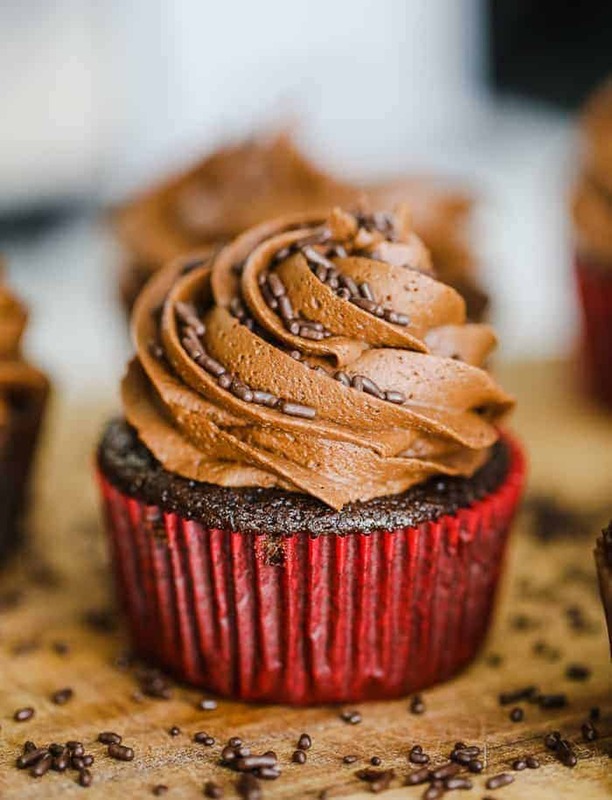 Make Chocolate frosting while cupcakes are cooling. Using mixer, whip butter and cocoa together until smooth in large bowl. Stir in extract of choice and powdered sugar. Add in almond milk and whip until frosting reaches desired consistency until light, fluffy and smooth, 1-2 minutes. 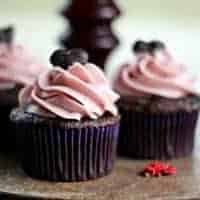 .When the cupcakes are fully cooled, pipe frosting on top or spread over top of cupcakes. 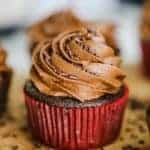 Frosts 12 cupcakes. For the frosting, you can substitute butter for the vegan butter if you don't care about the vegan option. 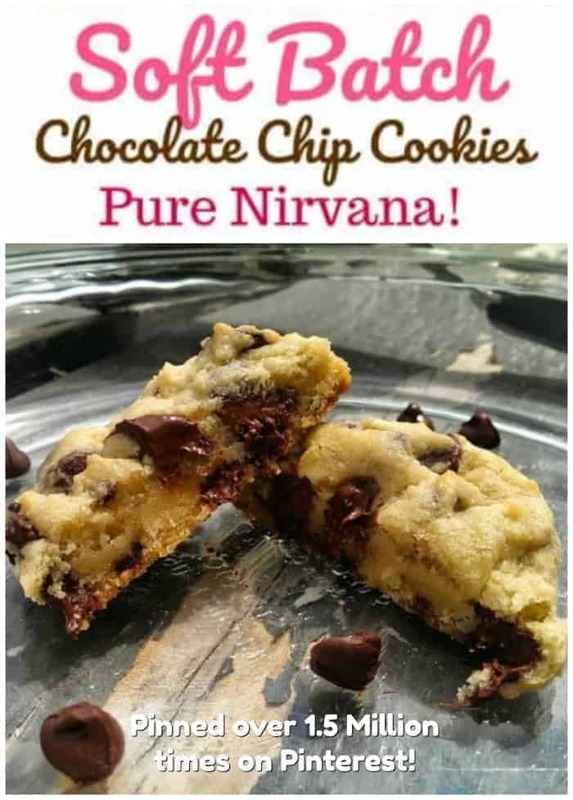 I’ve GOT to try these! 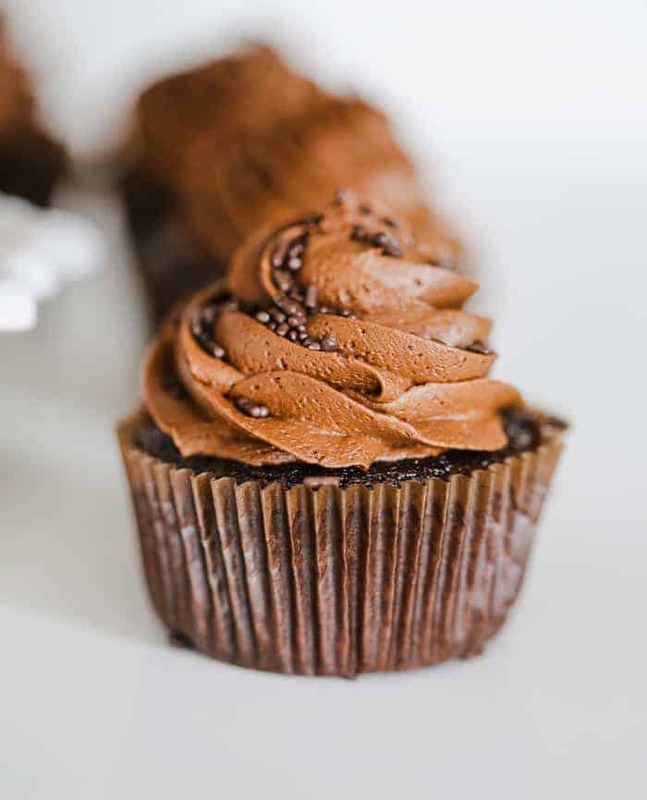 I love a good chocolate cupcake. I’ve heard of “depression cake” before but I never imagined it looking this delicious 😉 Have a good week, Kim! These ingredients will be in everyone’s pantry…. so no excuse not to try them!! Is it enough to make into a cake? Or do I double the recipe? I have a family member who is allergic to eggs so this would be perfect. However, I have another family member allergic to tree nuts. 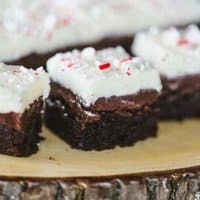 Can I use regular milk with the vinegar and follow the rest of the recipe since it doesn’t need to be completely vegan?